Conservation of monuments and historic sites is one of the most challenging problems facing modern civilization. It involves various cultural, humanistic, social, technical, economical and administrative factors, intertwining in inextricable patterns. The complexity of the topic is such that guidelines or recommendations for ntervention techniques and design approaches are difficult to set. The Technical Committee on the Preservation of Monuments and Historic Sites (named TC19) was established by the International Society of Soil Mechanics and Geotechnical Engineering (ISSMGE) in 1981, is supported by the Italian Geotechnical Society (AGI), and was renamed TC301 in 2010. 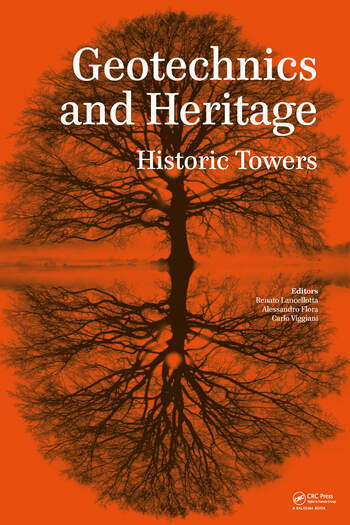 This book assesses the role of historic towers as symbols of community identity and how to best preserve this special cultural heritage. Well-documented, exemplary case histories highlight concepts of preservation, integrity, cultural heritage, dynamic identification techniques and techniques for long-term monitoring of historic towers, as well as provide examples of appropriate intervention measures. The book will be of interest to professionals and academics in the wider fields of civil engineering, architecture and cultural resources management, and particularly those involved in art history, history of architecture, geotechnical engineering, structural engineering, archaeology, restoration and cultural heritage management. Renato Lancellotta is Professor of Soil Mechanics and Foundation Engineering at Politecnico di Torino, Italy. He is author of research papers on experimental soil behaviour, in situ testing, soil-structure interaction with emphasis on preservation of historic buildings. He is chief editor of RIG (Italian Geotechnical Journal) and is author of the textbook Geotechnical Engineering, published in 2009 by Taylor & Francis / CRC Press. He is currently Chairman of the Technical Committee 301 (Preservation of Monuments and Historic Sites) of the ISSMGE (International Society of Soil Mechanics and Geotechnical Engineering) and has been involved in preservation actions on a number of monuments and historic sites, like for instance the Ghirlandina Bell Tower in Modena (Italy). Alessandro Flora is Associate Professor of Geotechnical Engineering and Ground Improvement at University of Napoli Federico II, Italy. He is author of research papers primarily on experimental soil behaviour, soil-structure interaction, seismic isolation, ground improvement technologies. Alessandro is co-author of a book on Jet Grouting published in 2014 by Taylor and Francis / CRC press. He is currently Secretary of the Technical Committee 301 (Preservation of Monuments and Historic Sites) of the ISSMGE (International Society of Soil Mechanics and Geotechnical Engineering). Carlo Viggiani is Emeritus Professor of Foundation Engineering at University of Napoli Federico II, Italy. He is author of research papers primarily focused on experimental soil behaviour, soil-structure interaction, pile foundation and preservation of monuments. He is co-author of a book on Piles and Pile Foundations published in 2012 by Taylor and Francis / CRC press. Carlo has been President of the Technical Committee 301 (Preservation of Monuments and Historic Sites) of the ISSMGE (International Society of Soil Mechanics and Geotechnical Engineering) and is now member of the same TC, appointed by the Italian Geotechnical Association. He has been involved in preservation actions on a number of monuments and historic sites and has been member of the Technical Committee in charge of the stabilization of the Pisa Tower, and is currently member of the panel appointed to monitor the behaviour of the tower. [...] this book shows the great attention paid by the authors to the historic background of the studied towers, built upon the analysis of its distress state and the need for preservation works. The story of the ten towers and of the events that have accompanied their construction and later life is fascinating, while offering a culturally interesting view of the monuments preservation issues. In conclusion, the book features a range of interesting suggestions, not only to engineers and architects but also for all who are in charge of providing directives, or making decisions, on saving heritage buildings."